Tomorrow (Monday) is in fact, the first workday Monday of the year (NB;last week’s was a holiday). Come tomorrow morning, we’re all headed out working our asses from dawn to dusk. This is what we aim at as we head out there tomorrow. Everyone wants to yield more quality and higher output at their workplace. Super productive! That’s the one quality every worker aspires to have. But unfortunately, most of us tend to be far less productive than originally intended. And to be fair, this sometimes isn’t our fault. There are many reasons for lack/low productivity. Dissatisfaction at work, personal issues among other problems are the few reasons. And also missing out some tips is also another reason. But either ways, cry no more!! This is 2018, and your chance to be highly productive is here. 1. Prepare before you get started. Lack of preparation for a task/project is a major cause of mediocre productivity. If you want to be highly productive than ever this year; 2018, you’ve got to cultivate the preparation habit. Failing to plan they say is planning to fail. Learn to always plan a given task ahead of it being started. 2. Sleep early and wake up early. Sleep is the most wonderful gift God ever gave man. But still, it is the most underrated of all gifts. Most business men, women and students don’t give themselves enough rest. I understand, there isn’t enough time. But in spite of this, you should give yourself rest. The importance of sleeping can’t be overemphasized. If you’re striving to be more productive, and you aren’t giving yourself sufficient sleep; you’re simply wasting your time. The body isn’t a machine, give it break daily by giving it 6-8 hours of sleep. But while doing this, make sure you also cultivate the habit of waking early. So as not to affect your daily routine. 3. Measure your work. Whenever a work is given to you, always endeavor to measure it. And when I mean measure, I’m sure y’all know what I mean. Measure the quality of the work done. Ask yourself if the task you just performed meets up with standard. That way, you’ll end up being more productive. 4. Share your material for feedback. On your quest to be more productive, always share your work material for feedback. Successful people know the importance of feedbacks as it helps them progress towards their vision and aids them in correction. Always try to share the material you’re working on or have worked on with people. These people can include your colleagues, family, friends or even your worst critics. You never might tell the insightful feedback any one of them may give you. Share your work with others!! However, while doing that, be careful. 5. Practice in public. One of the ways to maximize your productivity is to practice publicly. Due to our human nature, we all like to impress others. So, whenever we are in public, we try our best not to make mistakes. Why? Because we want to avoid embarrassment. However, we can use this nature of ours to boost our productivity. If you’re trying to boost your productivity, instead of hiding in your closet in order to avoid “embarrassment”, why not practice more publicly? Practicing publicly without pretending to be a perfectionist actually makes you learn more. If you practice publicly, there are people who may notice your quality and set backs. And some of them will encourage you and also criticise you. And this, will enable you to learn more and in the process more productive. So when next you plan on carrying out that project, why not go publicly. You never know who might come to your aid. 6. Eat the frog! Eating the frog is another way to boost your productivity. Eating the frog is actually a concept created by Mark Twain. Paraphrasing Mark, if you were to have two frogs in front of you, eat the ugliest one first! Mark Twain said, if the first thing you can do each morning is to eat a live frog, you’ll have the satisfaction of knowing nothing worst can happen after this. Your ‘Frog’ is your most important task of the day that you are most likely to procrastinate. In order to maximize your productivity, always do the difficult task first. 7. Set realistic tasks. Honestly, setting realistic tasks is a sure way to boost your productivity. Realistic tasks are tasks which are always SMART. When you set a realistic task, you will have no problem meeting up the specified deadline. Whenever you’re assigned a project, always make sure your plans/actions is realistic. This will ensure your productivity is boosted at a maximal rate. 8. Create a to-do list. A to-do list/schedule is a great way to maximize your productivity. Always endeavor to create a list of your activities ahead of your day. Your to-do list will enable you to focus your attention on the most important task of the moment. If you record all your tasks in a to-do list, you can easily review the list and prioritize the most important tasks.When you know that you can quickly refer to an organized to-do list, you’ll find that you can focus your attention on the activity that you are involved in – you’ll enjoy life more and be more productive. 9. Follow up the set target. Following up to the latter; your set target/deadline actually helps to increase your productivity. Always attach imposed deadlines to your tasks. It will propel you to take action and become more efficient. 10. Dump the distractions. Distractions are the chief killers of productivity. Distractions include unnecessary emails, Facebook, Twitter, Instagram, the internet etc. 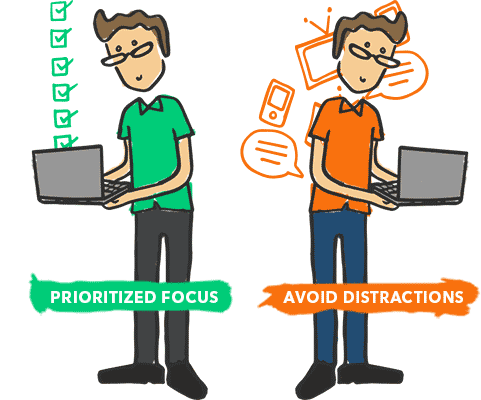 Distraction is the number one enemy of productivity. And just like an unhappy relationship, you should dump it. If you’re determined to boost productivity, you should dump those things distracting you. Yeah, you heard me right. Dump them. Restrict your data usage in order to reduce your social media usage. Starve your distractions! 11. Stop your addiction to TV. Still linked with the last point, addiction to TV is a major hindrance to productivity. Yeah, it is. TV is killing your productivity more than you think. Can you measure how many things watching TV has cost you? Your time? Creativity? Relationships? Focus? And over all productivity. Let’s face it, most of us are addicted to TV. And this is adversely affecting our productivity in our career. In your pursuit for productivity, why not cut down the amount of time watching TV and do something more helpful? And I assure you, it will surely boost your productivity. Is what I’m doing presently productive? Always ask yourself this question at regular intervals each day. It will make sure you stay on the right track. Especially if given deep thought to. 13. Take breaks. Breaks! I know this is your favorite part right? Taking breaks especially once a hour increases our work productivity. Recent studies shows that those who give in to some kind of distraction or diversion once an hour performed better than those who don’t take breaks at all. Why? Because our brains numb out a bit due to its constant stimulation and we become unable to continuously treat the task as important. Also, taking breaks also serves as a creativity fuel. It also keeps us from being mentally stagnant. 14. Reward yourself. Always reward yourself whenever you complete a given task/project. Why? Because it encourages and motivates you to do more. So when next you set out to accomplish that task, attach a reward to it. This will inspire you to give in your best. And this in the process, boost your productivity. Reward yourself. I hope you found these fourteen solid tips helpful? Let me know through your likes, shares and comments.